Ode to Monet is a fresh-new French inspired series based on Lisa’s recent art quest excursion to Paris & Giverney. 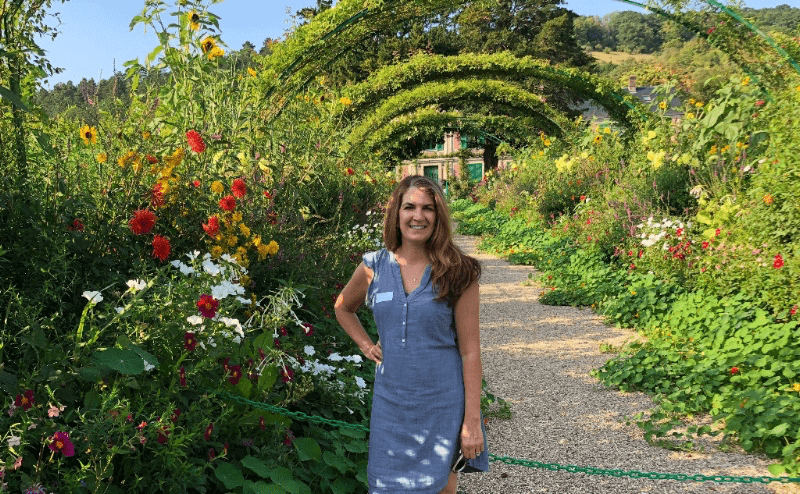 Monet’s garden in Giverny was a dream come true. 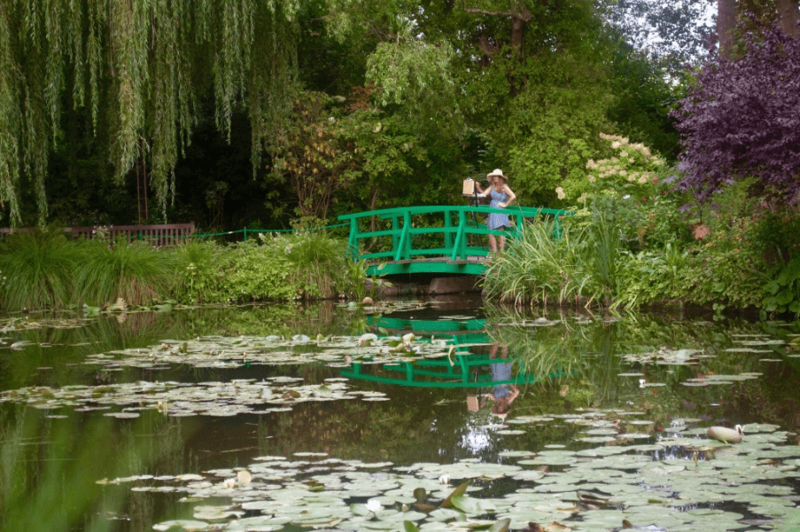 The museum allowed Lisa to paint in Monet’s garden and celebrated water lily pond after public hours. Stay tuned to see Lisa’s new exciting watercolors and acrylics! 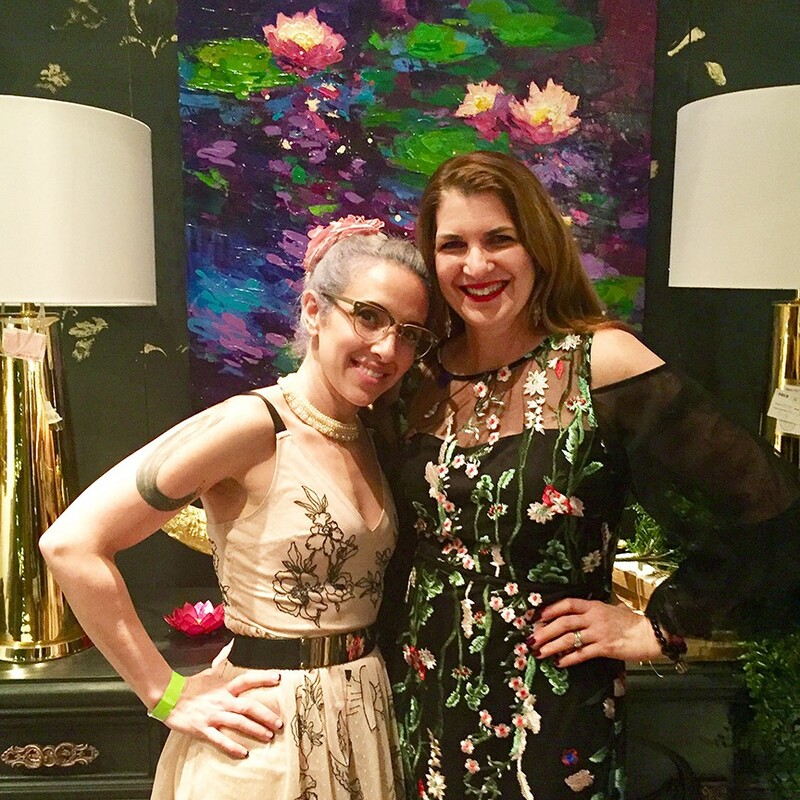 A big thank you to the uber creative designer Azie Shelhorse of Verdigreen, Montclair, NJ, for having Lisa Palombo Studios part of their room vignette, “Alchemical Romance,” at NYC’s premier interior design benefit, Design on a Dime. 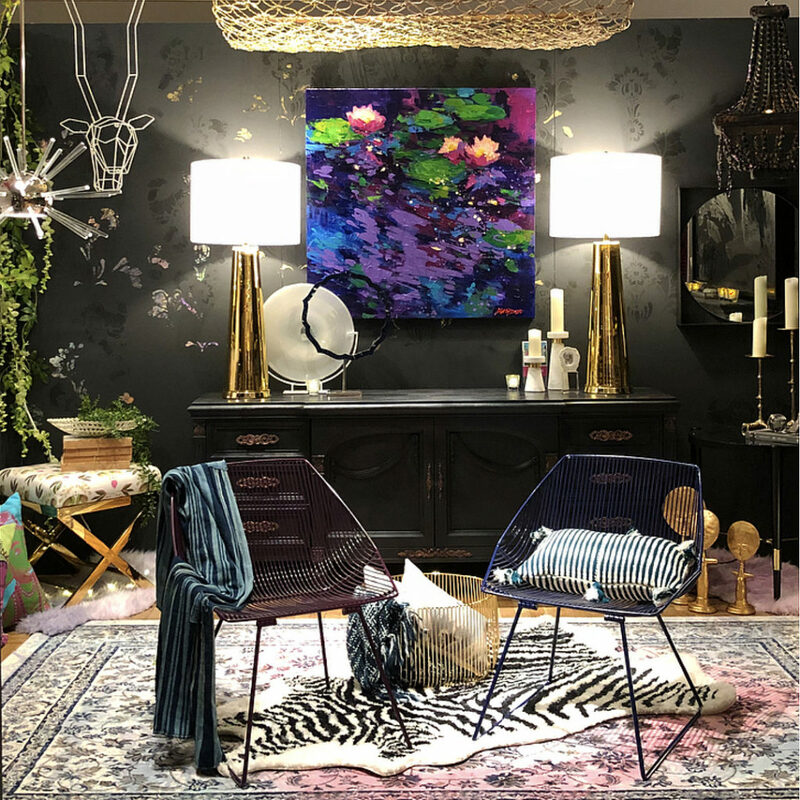 We are so honored to showcase Lisa’s latest painting, “Magic,” (shown above) 40″ x 40″ x 1.5″, acrylic on canvas, in Azie’s breath-taking vignette. It was a magical and dazzling opening night! 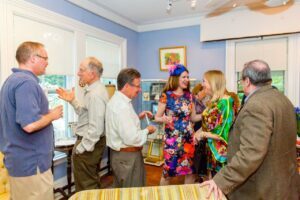 Since 2004, Design on a Dime has brought together interior designers who donate their time and expertise to benefit the work and program of Housing Works. Housing Work fights for funding and legislation to end homelessness and AIDS, and we feel fortunate to take part in this worthy cause. 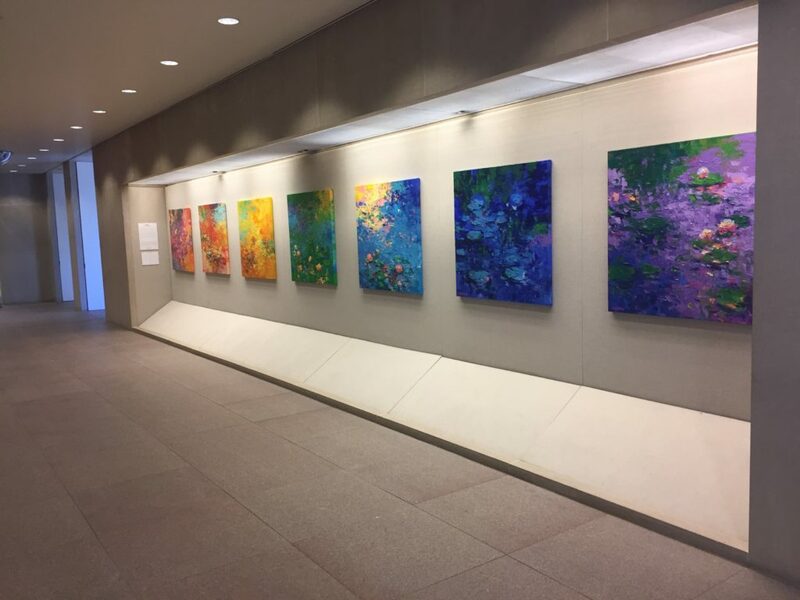 Lisa’s solo exhibition, showcasing her latest seven-piece water lily collection, “Rainbow Connection,” is on displayed through February 2018 at the new Corporate Art Gallery at Johnson & Johnson World HQ, New Brunswick, NJ. J&J has been a long time supporter of the arts, and it is a great honor to be chosen to exhibit at their global headquarters. Each painting in “Rainbow Connection” is limited to one color palette of ROYGBIV, an acronym for the colors in the rainbow: red, orange, yellow, green, blue, indigo, violet. As a whole, the collection reflects endless hue combinations and Lisa’s deep inspiration of the natural world and its beauty. 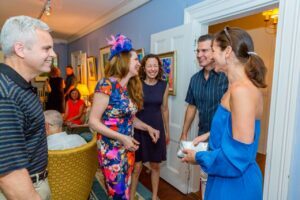 Presby Memorial Iris Gardens hosted a season long exhibition of Lisa’s new works inspired by the gardens in the historic Walther House located on the gardens in Upper Montclair, NJ. 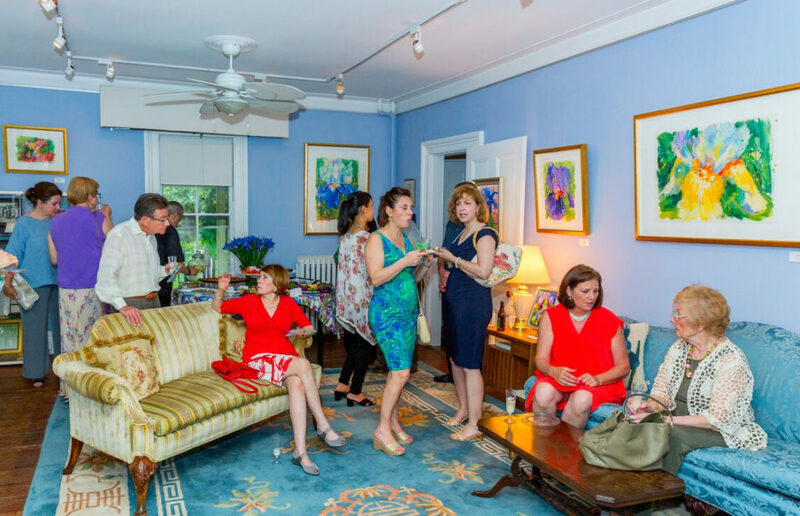 It was a grand time during one of the hottest evenings in May with lots of yummy treats catered by Laddey’s Lunch Box. 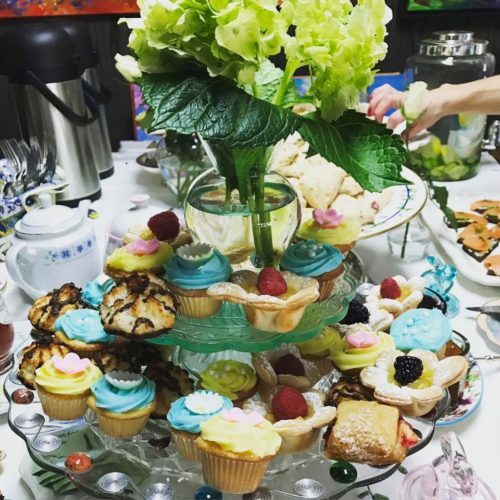 Lisa Palombo Studios hosted its 16th Annual Spring Open studio earlier this month. We hope everyone who came to visit enjoyed the festivities! Here’s a recap of a few things that were going on at this year’s show: First, we premiered Lisa’s latest documentary, “Living Waters,” a short film, directed and produced by cinematographer Christopher Plunkett of Stonestreet Cinema, which documents the creation of Lisa’s latest large-scale masterworks, also titled “Living Waters.” With the help of her children, Ruby and Nathaniel, the painting was unveiled to the audience after the screening! 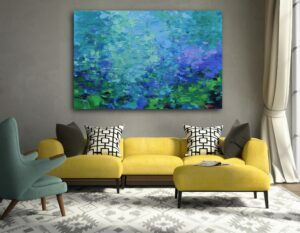 Click on the image below to watch Lisa paint this latest piece in her “Water Lilies” series and to hear more about her life as an artist. 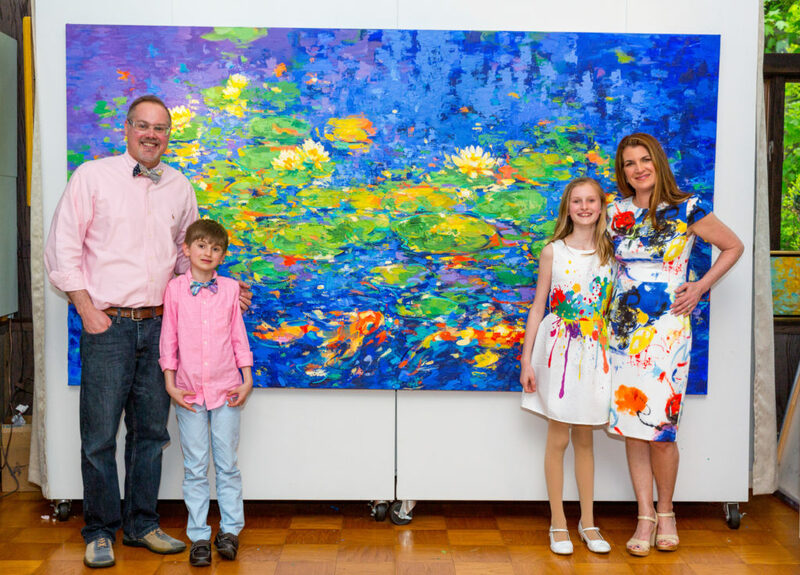 Picture above: Lisa with her family after the unveiling of “Living Waters,” acrylic on canvas, 60″ x 108″. Photo credit: Pushparaj Aitwal. “Living Waters,” short documentary by Christopher Plunkett of Stonestreet Cinemas. 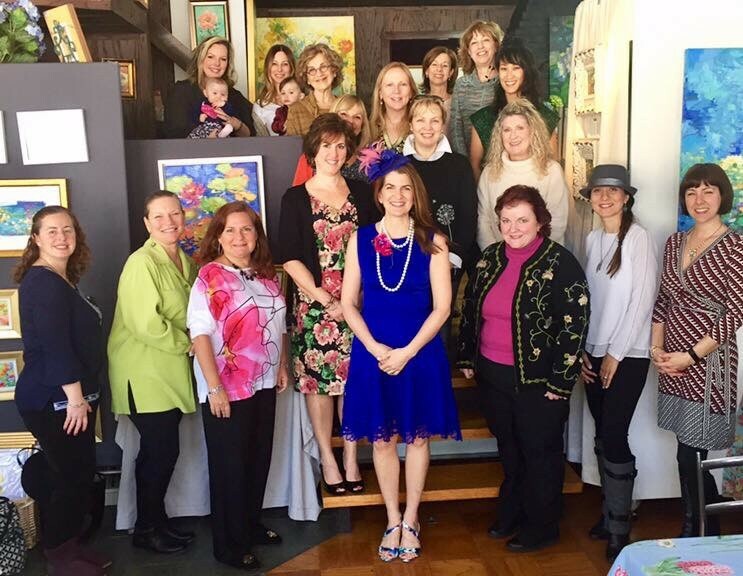 Lisa Palombo Studios hosted its inaugural Ladies Tea this March to celebrate the first day of spring. 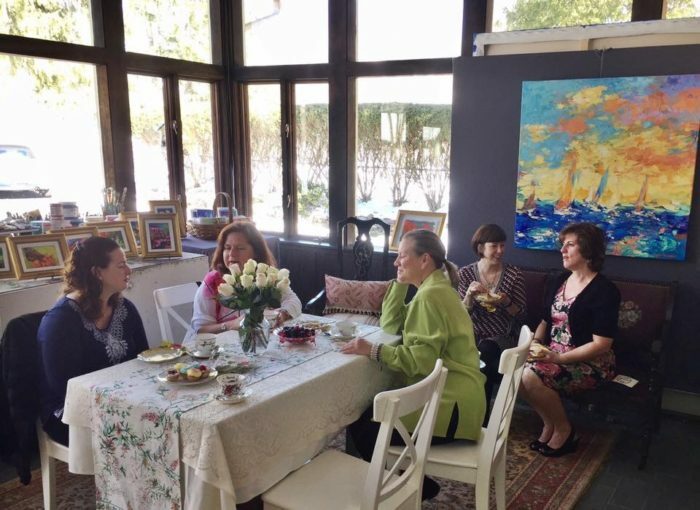 It was a beautiful sunny morning, and the studio was filled with lovely ladies, great conversation, and plenty of tea cups! Thank you to all who attended and for making it a most memorable day. It was a wonderful way to start our favorite season! The “sneak peek” unveiling took place September 24th at the beautiful Albin Polasek Museum & Sculpture Garden in Winter Park, FL. 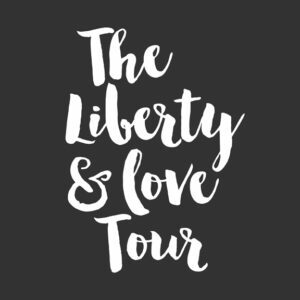 Be sure to follow us on the official Liberty & Love Tour Facebook page to see the behind the scenes making of this painting in Pierre H. Mattise’s Florida studio and to keep up with the latest news and events on this painting’s journey and it’s message of Liberty and Love. Our latest short film! 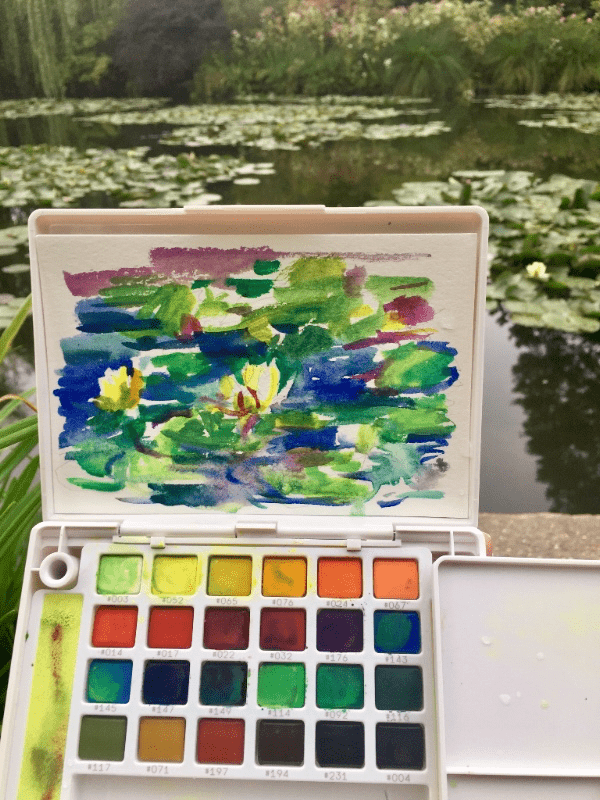 Watch Lisa start a large painting en plein air during the peak season in the renown Presby Memorial Iris Gardens (Upper Montclair, NJ) and then take it to finish in her NJ studio. Thank you Black Board productions (Hoboken, NJ) for being a part of this amazing creative project! 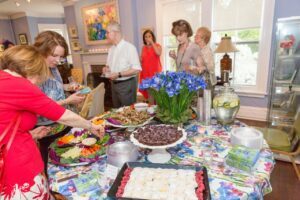 This season, the world-renown Presby Memorial Iris Gardens hosted the American Iris Society’s 2016 Convention in which Lisa was a featured participant. 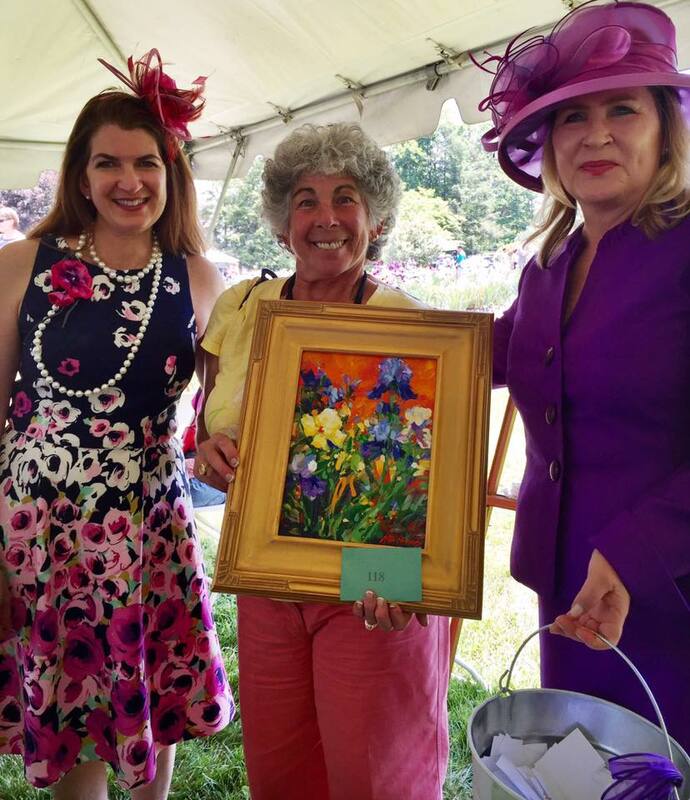 Pictured is Lisa Palombo, winner of Lisa’s iris painting, and Nancy Skjei-Lawes (president of the Presby Memorial Iris Gardens) at the luncheon in the garden. 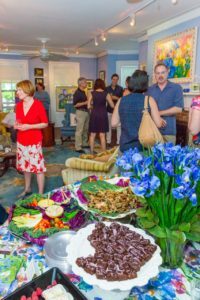 Soon to be 100 years old the American Iris Society has grown into a large vibrant organization that is dedicated to the iris, the flower of the rainbow and it’s members who love them. 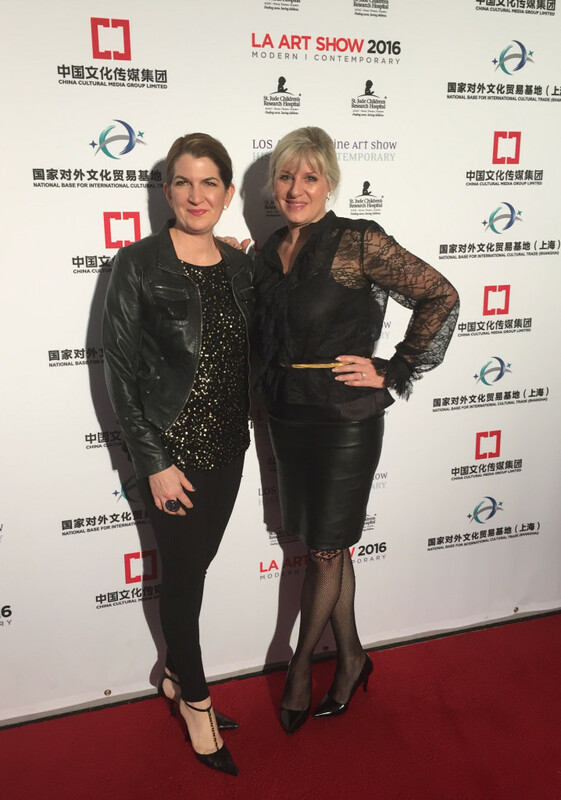 The LA Art Show claims to be the largest, longest running, most comprehensive art experience on the West Coast and the most diverse Art Fair in the world. Not only that, it’s filled with celebrities and actors walking throughout the Opening Night Premiere Party and 5 day experience. Ethos Contempory Art in Newport Beach, CA represented Lisa’s art at the show. Pictured here is Lisa and artist, Georgeana Ireland at the opening night premiere party, hosted by Anne Hathaway and Adam Shulman. 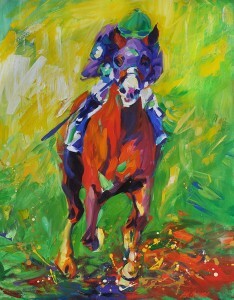 Lisa Palombo’s painting, “California Chrome: In the Lead” has been selected as the only original painting to be featured at California Museum’s exhibition – California Chrome: A Race For the Dream. 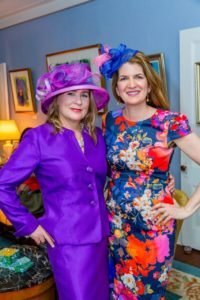 The year-long exhibition features never-before-seen artifacts from the personal collection of California Chrome owners Perry Martin and Steve Coburn. 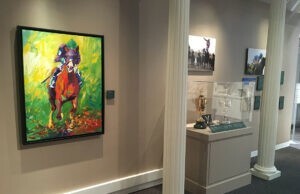 The exhibit also explores the career of California Chrome, the California-bred horse who capped a six-race winning streak in 2014, including two legs of the infamous Triple Crown. He is recognized as the 2014 American Horse of the year and “America’s Horse” due to his lowly pedigree and humble beginnings. 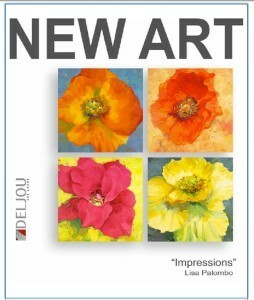 Deljou in Atlanta, GA Represents Palombo’s “Flower Power” series. 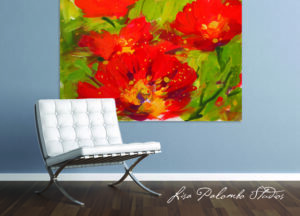 “Sun Kissed” (22″ x 30″, acrylic on paper by Lisa Palombo) is featured as one of the 8 step-by-step demostrations in the latest Best Seller edition of Exploring Color. Click here to purchase on Amazon.com. 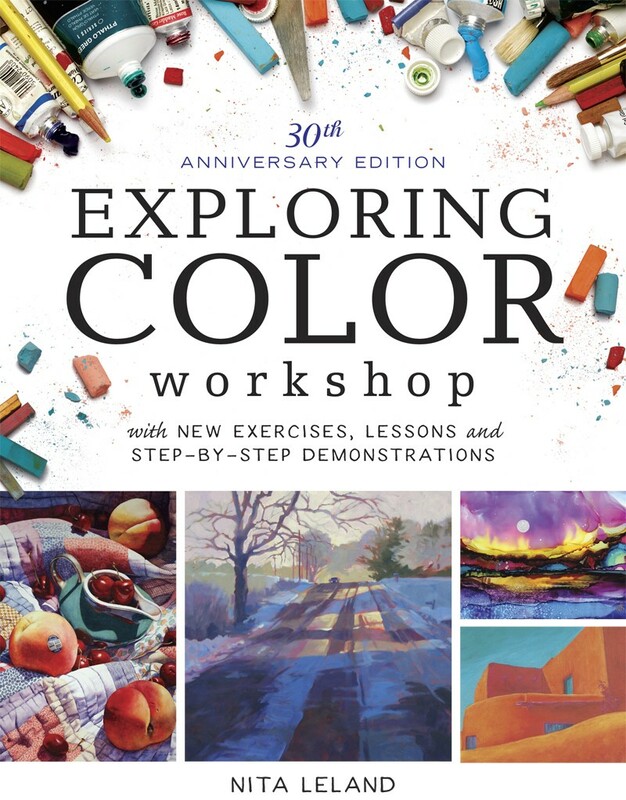 This updated 30th anniversary edition of the North Light classic Exploring Color teaches artists of all mediums and skill levels how to use and control color. 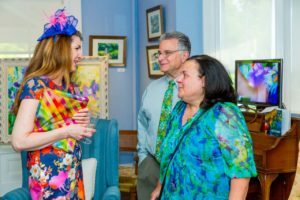 With a fresh new design expanded to 176 pages, Best-selling author Nita Leland displays inspiring artworks by 58 artists as examples of what’s possible when you understand how color works. Nita shows you the way to more expressive painting through color. In addition to more than one hundred contemporary paintings, Nita’s book includes 90 hands-on exercises, 8 step-by-step demonstrations and countless nuggets of color knowledge throughout. Work at your own speed—in your own private workshop! 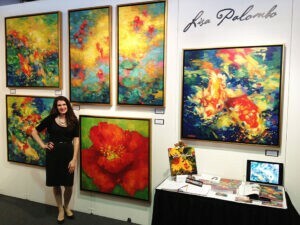 Lisa Palombo debuted her new koi series as well as her popular water lily and floral paintings at ArtExpo, NY. ArtExpo, NY is the world’s largest fine art trade show. 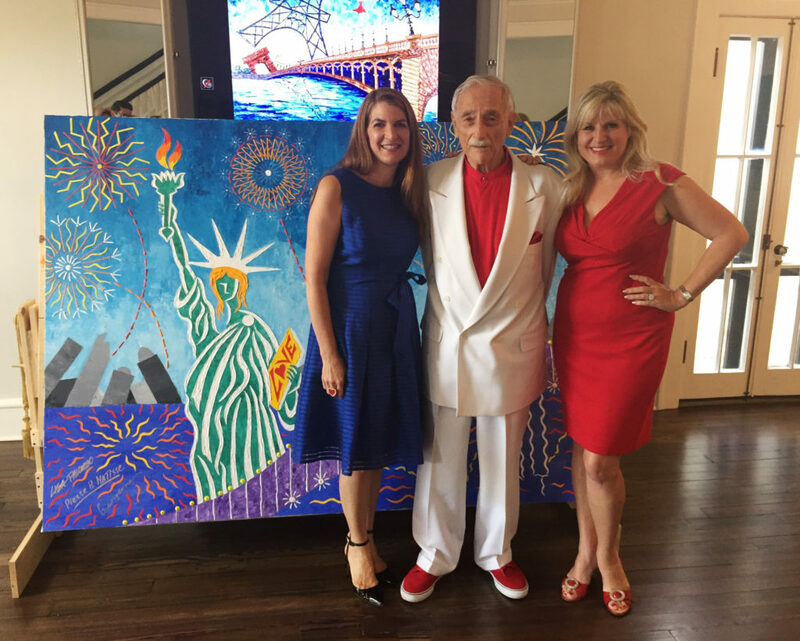 Over its 34-year history, ArtExpo NY has hosted many of the world’s most renowned artists, including Andy Warhol, Peter Max, Robert Rauschenberg, Robert Indian, Keith Haring and Leroy Neiman. Palombo appointed as an Advisor to NYC-based Fastlane Communications for experiential marketing, brand color palette development and design consultations for global 2000 brands. 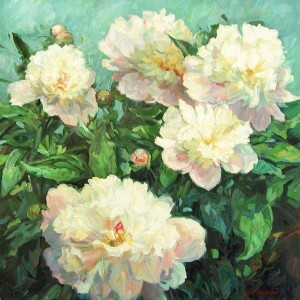 Columbia Pictures selects “White Peonies” painting for the feature film, “The Bounty Hunter” starring Jennifer Aniston and Gerard Butler, directed by Andy Tennant. 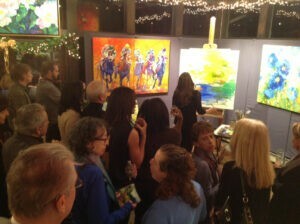 Palombo wows crowd at VIP demo night at her studio gallery. To see video of the night, click here.